The second and third steps in our product development process are Pilot trials and Reproducibility and Repeatability (Scale-Up) trials. 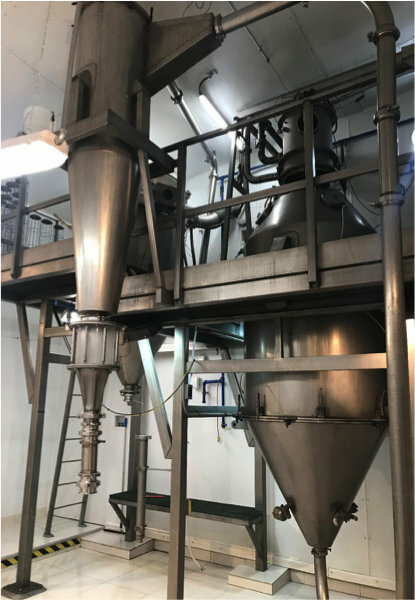 Our goal with Pilot Trials is to produce pulse-dried powder for your evaluation, and to optimize dryer throughput, yield, and efficiency, in addition to powder quality. Level I: Initial determination trials: Normally 8 hour trials where we run up to 6 short trial runs to determine dryer settings, temperatures and configurations for atomization and to evaluate initial powder characteristics and performance. Level III: Scale-Up Trials: 8 to 16 hour extended runs to prove reproducibility, repeatability, dryer efficiency and product yield. These trials can be done on pilot- or production scale. Levels I through III will be conducted under one or more quality grades based on your product requirements. Grade III: Food- / Feed- / Nutraceutical products. Trials are conducted under PCS HACCP and GMP protocols. Our Product Development Team will guide you through this process and make proposals toward different levels and grades based on your trial objectives, product requirements and the bench test results. Please refer to our Getting Started page on how to start your product development process. We require both the “Bench Test Request” and “Pilot Trial Objective” forms to be completed and submitted before we can start the process.